Securing the Internet of Things provides network and cybersecurity researchers and practitioners with both the theoretical and practical knowledge they need to know regarding security in the Internet of Things (IoT). This booming field, moving from strictly research to the marketplace, is advancing rapidly, yet security issues abound. 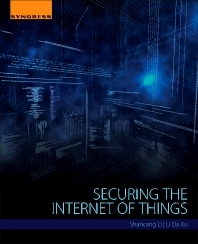 This book explains the fundamental concepts of IoT security, describing practical solutions that account for resource limitations at IoT end-node, hybrid network architecture, communication protocols, and application characteristics. Highlighting the most important potential IoT security risks and threats, the book covers both the general theory and practical implications for people working in security in the Internet of Things. Shancang Li is a senior lecturer in the cyber security research unit, Department of Computer Science and Creative Technologies at University of the West of England, Bristol, UK. Shancang previously worked as a lecturer in Edinburgh Napier University and a security researcher in cryptographic group at University of Bristol. In the past few years, he conducted mobile/digital forensics across a range of industries and technologies. His security background ranges from network penetration testing, wireless security, mobile security, and digital forensics. Senior Lecturer in the cyber security research Unit, Department of Computer Science and Creative and Technologies, University of the West of England, Bristol, UK.